First of all I'd like to say a huge thank you to you all! I've been absolutely bowled over by how many of you have reached out to me following my post my mojos back! I'm astounded by how many messages I've had....so many of us are feeling the same. So much advice has been shared that I've decided to do a little series on my journey. I'm no medical expert but I will be paying forward the nuggets of brilliant information I've been sent. My first port of call is a visit to my GP. I'm over the wobble at the moment but that's not to say it won't come back in waves. If/when it does come back I want to be prepared. My plan is to see my Doctor prepared and thanks to Nicky (MumsontheVerge) recommending Dr Louise Newson @menopause_doctor I'm going to make sure I'm asking the right questions in the right way as the appears to be crucial in getting the help you want. I shall report back on that as well as the many other practical tips and remedies that have been suggested to help with the symptoms I've expressed (I'm still getting the night sweats and insomnia). My wish is that someone, somewhere will benefit (as I have already!) albeit from the smallest change. I honestly can't thank you who have contacted me enough.....it really does mean the world to me. Anyway, back to what I love best! 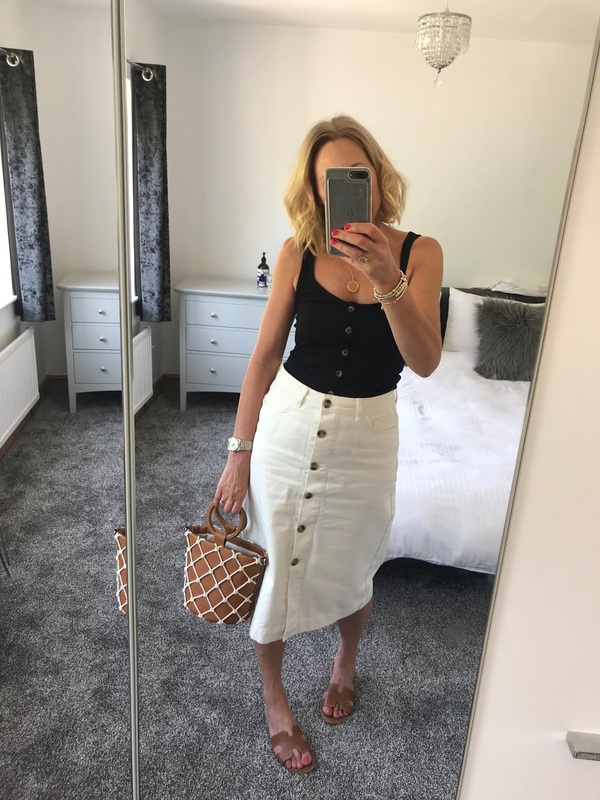 Let me leave you with an outfit round-up, I'm back to really loving my clothes again.....which makes the blog a joy again! Righty-o! Wishing you all a wonderful week ahead.....be back soon! I wanted to comment on your last post, but couldn't find the right words. I am 48 and peri menopausal too. I started only wearing fabrics that "breathe" to keep my body temperature in check and avoid hot flashes during the day and night. No more hot baths at night too. Take your vitamins, try to eat something green everyday, exercise to "break a sweat" and keep your muscles tone. I put on weight too even with the workouts 2x a week with a trainer! I'm going to try to walk a bit more where I can to keep the weight gain at bay. Don't feel bad we are all going through it. I can't take estrogen so the only thing I take is exercise and it does help a lot. Keep smiling! I love your style.